This a sandbox game no? then why do we need 3 different games to play different aspects of it? the mechanics don't need to be exactly the same ie dusts skill system vs eves skill system and if you don't want to play one aspect of the other then don't i think if implemented like this it'll be easier to integrate them all together. - Valkiria will be separate project . - Eve and Dust skill tree can be easy merged down, but you must to know that in Dust you can earn SP much faster then in Eve and in active mode too. Convertion ratio can be done easy via implants in both way. They are different games because they are meant to appeal to different audiences. And they do. Dust would probably have a population to rival EVE if it wasn't initially designed by supremely inexperienced devs and put on a seriously lacking piece of hardware. Valkyrie appeals to the dogfighting crowd which is niche, and VR moreso. It kinda has to be its own thing. the PS3 is more than capable of handling the game. The inexperience the dev's have with FPS is more than obvious though. Things such as client side calculations, fluid movement compression, MINIMUM 30 FRAMES PER SECOND, and client side exploit banning are all standard practices with pretty much every FPS on the market. TBH they need to figure out how to do all of this in dust first before they ever decide to throw money at another game to develop. Otherwise this entire process will just repeat itself. EVE succeeded in large part due to lack of competition. There was very little that offered what it had. However the FPS is some of highest tiers of game development if you want to last. The PS3 has roughly 153 mb's of ram free for use by devs after the OS gobbles it up. Do you know how much Dust was attempting to do with that much memory? More than other games by a lot. Frankly we should all be impressed that anything can run at all on that terrible piece of hardware. Eve is actually a super game in its own right. It is far larger and more developed than any game ive every encountered in my 20 yrs of online gaming.Ive been playing off and on since 2008 ( about 5 years of total active account time) and i have yet to fly every ship, visit ever solar system( not even including wormhole systems) and my skill tree is nowhere near maxed. Ive never played a game that is as vast. Honestly, Eve is a top of the line game even though its got a few years on it. CCP keeps investing in it and upgrading it and rebalancing it. That said, I have not played Dust or Valkyrie( just being nosy here). It would be cool if they integrated all 3 into an Eve Universe but Eve itself is a very complex game. Integrating is something that would have to be done in steps. Their would have to be a reason to integrate Valkyrie and Dust into the current Eve universe. For Valkyrie it would make more sense. We use drones and even our fighters are drones. Having real people control the fighters would be interesting. But you have to ask what purpose would it serve? What benefits can player controlled fighters give Eve players that fighter drones and frigates cannot? They need a role, They need to be better than fighter drones but not as good as frigates. For Dust, its what role do planets play? What unique role can dust troops add to the eve universe? Dusters need a unique and beneficial role in the current eve universe. A role which requires the finesse and hands on of boots on the ground rather than the bombardment and orbital take overs with spaceships. Valkyrie and Dust have to be incorporated into the eve universe. Roles have to be created for them so they can affect the eve universe. All 3 games must be balanced within themselves but also be balanced between each other. Its not nearly as simple as just smashing them together. If anyone can make it happen its CCP. They have been consistently on the cutting edge of MMO technology. While other MMOs grow and then fizzle out, Eve continues to evolve. It is something that would take a lot of work and a lot of integration. But it would make for an awesome SMMO. Imagine a fleet made up of everything from titans to frigates. Carriers and super carriers with fighters controlled via the Valkyrie interface. The fleet is the spearhead of a larger fleet. Support ships out of harms way. One of these being troop ships with Dust soldiers. A system is invaded. The combat ships remove the defending fleet from the system and lock the system down. Several troop ships approach the station with a few carriers and fighters defense. Dusters assault the station able to gain entry. Once inside teams move through the station securing C&C, Aux C&C, and Engineering. Effectively taking over the station. Teams then clear the station of enemy soldiers. On planets, Drop ships are launched from troop carriers. Fighters( valkyrie) designed for atmosphere combat are launched in low orbit to provide air cover. The dust troops take over important defense and command structures for the planet. Damage to the planets infrastructure is minimized. After some minor repair the new owners can use the structures on the planet. You log in to what role you want to play. Capsuleer, dogfighter, or trooper. The way I would like to see Dust develop is as a means to develop the significance of planets as you describe to provide access to parts of New Eden you otherwise don't get to see. Cities, stations, asteroids, etc would serve as Duster battlegrounds instead of the existing planetary industrial wards that we currently fight over. I mean I've pitched it to the Dust community that as it stands 'Dusters' or Cloned Mercenaries simply don't make much economic sense. I mean why hire one cloned soldier for say the 300,000 ISK we earn in Public Matches when you could likely hire and outfit 1000 baseliners outside of CONCORD's jurisdiction for the same price. I'd like to see us as highly specialized operatives deployed to warzones too dangerous or difficult to deploy to without extraordinary means. Asteroid colonies and facilities, dead space wrecks, orbital infrastructure like citadels and I-Hubs, or even Shattered Planets and Frontier Urban areas. I mean in New Eden a soldier who can be part astronaut, part operative, and part super human enforcer and whose experience is never lost through attrition would be well worth a few thousand ISK that capsuleers would never miss if we could hire out or services in more robust and better implimented models. Personally I see no value in EVE Valkyrie in terms of integrating into the universe and while that might sound like petty Duster nonsense I don't really see what value dog fighters would have that frigates do not already provide in game besides perspective. I never played Dust, simply because I don't want to buy the console. Same goes for valkyrie .. Gé¼750 is way to much. 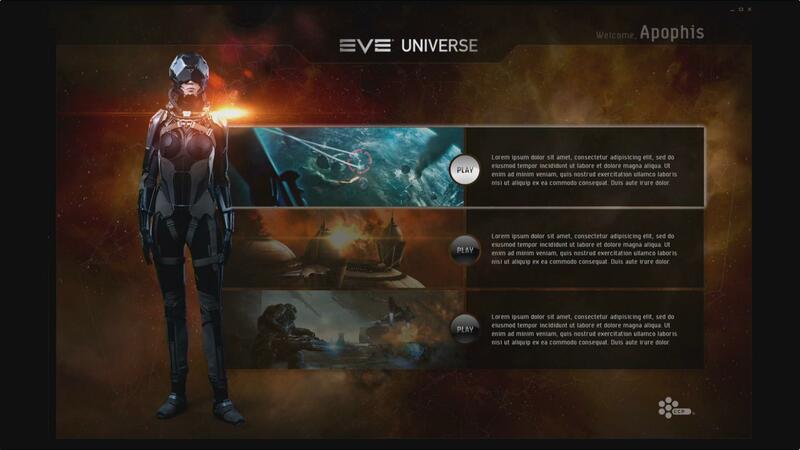 But I would for sure love to see that all 3 games will merge into the EvE univers. EvE is going to lack behind games like Elite Dangerouse and (the upcomming) Star citizen. Eve is already loosing players and will loose some more if Star Citizen comes out. They basicly (gonna) provide what eve is providing in 3 single games were you have to spend Gé¼750 on a VR, Gé¼200 on a console and need a state of the art PC to run the VR. So, CCP please give us Dust on the PC and make Valkyre and the upcomming Gunjack, playable without the VR. Give all 4 games a meaning in the EvE univers .. and it could be so easy done, you have most already in place for it. Finish the 'walking in stations' wich you promised us already years back. players can come into the station, get into their battle suits and make it down to the planets to fight (Dust) ,get into their fighters and battle others in the orbit from the planet (Valkyrie) or get to the defense guns from the station and shoot incomming attackers (Gunjack). This finnaly gives stations a whole new meaning and what they are ment to be. Taking SOV should not only happening in spave/system but also in the station and on the planets ground. I petition that all games should merge into eachother. We the EvE players are entiteld to it. Lead me, Follow me ......... or get the hell out of my way. You are entitled to absolutely nothing. It's CCP's game. If we, the players, don't like it, we can unsub and leave. Star Citizen isn't going to draw players from EVE....at least, not the good ones. SC is going to be a non-PVP carebear paradise much like STO. Has a much different player demographic. And that's assuming it ever comes out. A lot of people think it is just a scam at this point. I would be happy just to hear that EVE Legion (the supposed port of DUST to the PC) is a real project and not just vaporware, but I've pretty much given up on that as well. DUST was a great concept that ended up being scuttled due to Sony being dicks. DUST was meant to end up on the PS4.....didn't happen.